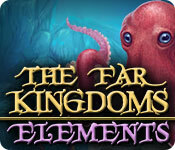 The Far Kingdoms: Elements is rated 3.4 out of 5 by 28. Rated 5 out of 5 by Nikoal048 from Very Fun Match-3 & Hidden Object Game! I love this game! I love the Match-3 games and the Hidden Object games and this one has both! I wish they would make more games like this one! I have fun every time I play! I don't want it to end! Thank you BigFish! Rated 5 out of 5 by a7752p from Hidden Object/Match Three Combo I really like this game. I am tired of HOs but with this game you have the option of doing either HOs or Match Three. Has a nice light story line instead of the usual dark dreary story line.Wonderful graphics and easy to follow instructions ,with no timer.Has even some puzzles like you find in the HO games. Have just completed the trial period and will buy with my monthly club coupon when it comes. A refreshing game and a keeper! Rated 5 out of 5 by kittypaws2 from The Story Continues1 Exciting story line, with great scenery,music and the best of 2 games in one;hidden objects and match 3. My two favorite games. Rated 5 out of 5 by twtscat48 from Great Game! I liked this game a lot. It wasn't the typical Hidden Object, it also incorporated match 3 as well. The graphics were very nice, crisp clear, the characters are cute. It's a definite buy for me when I'm done the demo. Recommend this game!! Rated 5 out of 5 by mrm2006 from Princess Ariana needs our help .... again. While the Princess is away, the rats will play. Morgana is back and wreaking havoc on Princess Ariana's kingdom, turning everything and everyone into ..... stone. Now, it's up to you to help the Princess restore her kingdom and deal with the evil Morgana ..... again. The graphics are good. There are no voice overs so everything has to be read. Really? In this day and age? Tsk tsk tsk - lol. There are 3 levels of difficulty. I chose "casual" so I can get an idea of what's offered for beginners. There is an optional tutorial, which is very nicely done and a journal which contains useful story line and game play information. 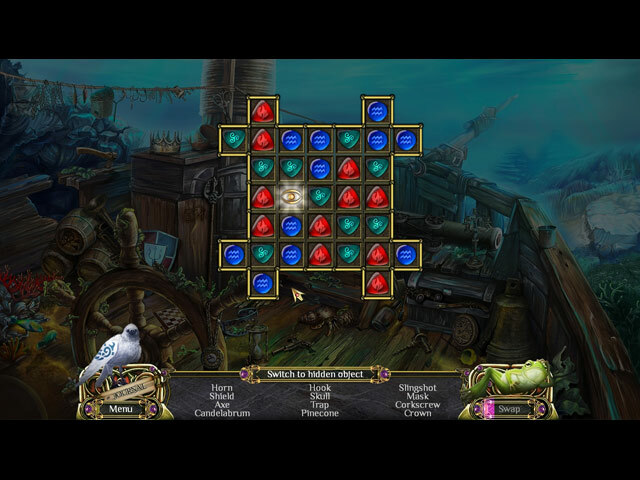 Our friend, "frog" the hint button is back as is Corvus, the white dove, who has delivered the Princess' magic amulet. The magic amulet can be used to make fire and burn things. YAY! 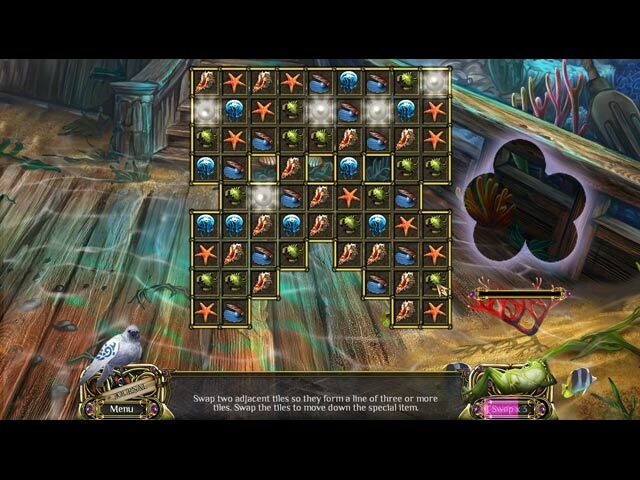 This is a combination match 3 and HOG (hidden object game). The match 3 part of the game is fun and fairly standard in game play. My level of difficult was not timed. That's NOT saying it was easy either - because some of the levels, even early on, were difficult to pass. The HOGs are fun, itemized list types. Sometimes, the items can be difficult to find. Sometimes, you are offered an alternative game to play - but only sometimes. Hmmmm. I love the characters you meet along the way. I love the continuing story line. I love the balance of story, match 3s and HOGs. Well, I guess I LOVE this latest in the Far Kingdom series - lol. This is a great game for beginners and experts alike. Not for the difficulty challenge but for the story and fun game play. It has true entertainment value and is a definite purchase for me. Come along and join me in helping "frog", Corvus and Princess Ariana restore the Kingdom. ENJOY! Rated 4 out of 5 by radarsweet from Short & Sweet Picked this up on a daily deal, & I'm glad I did. This game is very short; I finished it in less than 2 hours. What I loved though, was that it combined match 3 play with Hidden Object. To any of us who play these games often, you'd find that this one isn't much of a challenge. It was a nice way to kill a couple of hours. The mini-games were, for the most part, simple to understand & complete. There aren't any voice overs in this one, but they're not really needed. I wouldn't give this game much of a rating for re-play value, unless of course you're into match 3. There's a good mix up in this game, but as I said before, really short. So enjoy! Rated 4 out of 5 by tutortime from Easy Game Very short game play on this one. However, the graphics were nice. Interesting mix of Match 3 and regular game. I enjoyed it. Great use of a free game. Rated 4 out of 5 by vmomahhj from GREAT!!! 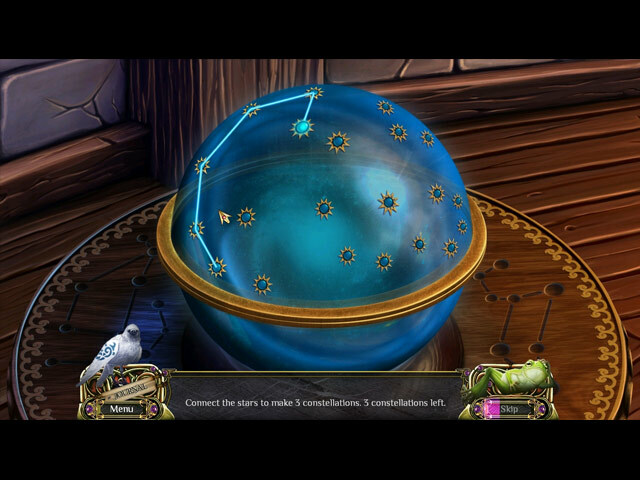 This was a great game and it was combine with hidden object and match category. I would recommend this game to others. Rated 4 out of 5 by procats from Length of Game I thought the game was "fun". Seems like you just really got into the game and it is over. Come on. Give us a little longer play than this in a game. I am really happy I did not pay full price for this game or I would have been upset. Because of the length, I do not recommend this game. If it had been longer, I would have said yes, yes, yes. Rated 4 out of 5 by denniann2 from morgana's back morgana's back and has cast a spell over the area. you have to fight her again. this is a match 3 game and HO scenes game. i liked switching back and forth. you have a diary but i don't remember a map. i didn't like this one as much as the others. i am not sure why, but i just didn't.